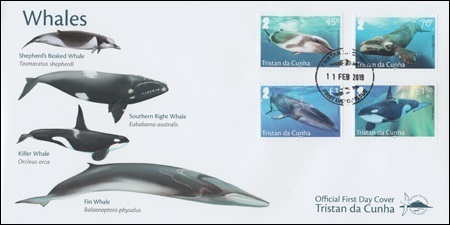 Stamps showing four of the whale species found in Tristan waters. Shepherd's Beaked Whales are part of a poorly understood group of whales that are found in very deep, offshore waters and are rarely observed at the surface. Some beaked whales have never been seen alive and are only known to science when animals have washed up onshore. Shepherd's beaked whales can reach lengths up to 7 metres and are known to be found in only in the Southern Hemisphere in cold temperate waters. They feed on squids, crabs and a bit unusual for beaked whales, fish. 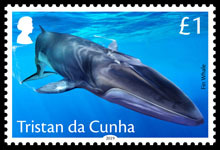 There have been a few stranding's of these whales on Tristan da Cunha and several sightings off the island. National Geographic's Pristine Seas Expedition captured some video footage of Shepherd's Beaked Whales in the waters around Tristan, meaning it could potentially be an important area for these mysterious marine mammals. The southern right whale's common name is derived from being the "right" whales to hunt during the 17th century because they are slow moving, yielded much precious oil and breed in sheltered coastal waters. They can reach lengths of up to 16 metres, and have a wide, black body shape but no dorsal fin. They are filter feeding baleen whales that can been seen skim feeding with their mouths open collecting thousands of copepods or krill in their feeding grounds. It is thought that the waters off Tristan are a right whale nursery area as most of the whales hunted in the "Tristan grounds" during the 19th century were mothers with calves. The population numbers recovered a bit by the mid-twentieth century but then illegal Soviet whaling during the two years after the 1961 volcanic eruption decreased the number of whales around Tristan. 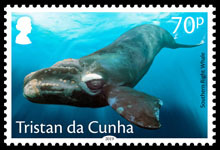 Today, right whales are sometimes seen from the shores of Tristan da Cunha between September and October. Fin whales are second only to blue whales as the largest animal on the planet, and they can reach lengths of up to 26 metres. They have very streamlined bodies, with a large triangle shaped dorsal fin and are nicknamed "greyhounds of the sea" because they can swim at speeds greater than 20 knots. They are baleen whales like the southern right whale but only feed on krill in the southern hemisphere. They are unusual in two ways. The first is that they are sexually dimorphic, with the females being about 5-10% longer than the males. Secondly, fin whales are one of the few animals to have an asymmetrical colour pattern on their jaws with the left side being dark grey and the right-side bright white. They may use this white jaw to startle their prey species when they are feeding. Fin whales can be seen in the offshore waters around Tristan on their way to and from the Antarctic feeding grounds. Killer whales are the largest of all the dolphins that reach a maximum length of 9 metres and can be found in all the world's oceans. 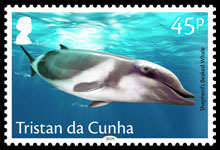 They are one of the most widely recognized marine mammals with the classic black and white patterned body. Killer whales are the ocean's top predators; different ecotypes specialize on different prey, from marine mammals like seals, to fish and even sharks in some parts of the world. They are very social animals that live their entire lives in small female led family groups (known as matrilines) that can have unique dialects. 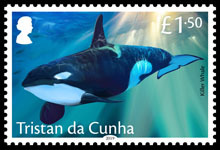 Killer whales are occasionally seen around Tristan da Cunha but very little is known about these charismatic whales in the South Atlantic.